The 1962 #850 Bubblecuts came with various color lips and nail colors. You'll see a lot with a watermellon color. They were on the hollow barbie only body too. They had the smaller neck knob. Haircolors. Brunette, Titian, and Blonde. There is a rare Platinum hair color with pink lips that may have turned to white over time. This is the year they changed to the red swimsuit. 1962-1967: Red One-Piece Swim Suit, Red Open Toe Heels, Black Wire Stand, Booklet. (1961-1962) - Barbie ® Pats. Pend. ©MCMLVIII by Mattel Inc.
(1963) Midge T.M./©1962 Barbie ®/©1958 by Mattel, Inc. 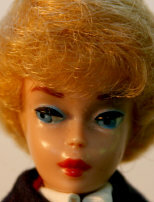 The 1961 Bubblecuts (#850) came with red lipstick and were on the hollow barbie only body, which is the same body as that of the ponytail #5 Barbie. They had a smaller neck knob. 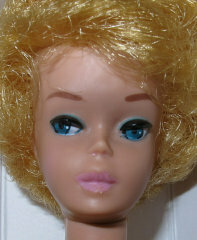 These blue eyed Barbies often have greasy faces. 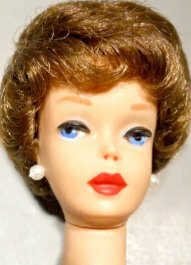 (There was a breakdown in the vinyl Mattel used to make the dolls.) They also have a shorter bubblecut hair syle; Haircolors: Raven (black), Titian (red), Blonde, and the extremly rare brownette. She came with a black and white swimsuit. 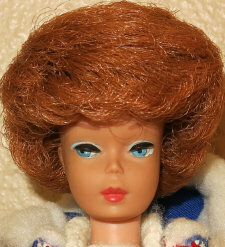 In 1961 they had red lips, with one variation to this Barbie, and she was called a White Ginger because her lips were a bubblegum pink color. Everything else was the same. She is much harder doll to find. The rare White Ginger was only issued in 1961. She has a tight bubblecut hair style. 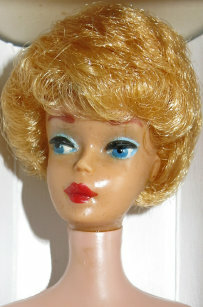 She's on a Barbie only body with the small neck knob. 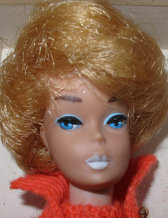 She has dark turquoise eyes, pink bubblegum lips, red nail and toe polish and very light blonde hair, which over time could oxidize to a darker blonde. 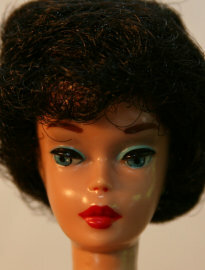 In 1964 and 1965, the Side Part Bubblecut Barbies were released, but only in Europe and Canada. Mattel did not have them available in the United States, which makes them a rare doll! 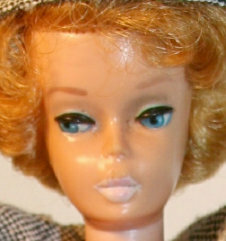 Shown above are three 1961 #850 Bubblecut Barbie dolls(brunette, blonde and titian hair). They came with their black and white striped swim suit, white sunglasses with blue lenses, black open toe heels, black wire stand, and a pink booklet with a picture of barbie and Ken on the front of it.